Since I manage a running store, I have a definite interest in what shoes people are wearing. I can’t help but scan the athlete feet at any race I attend. 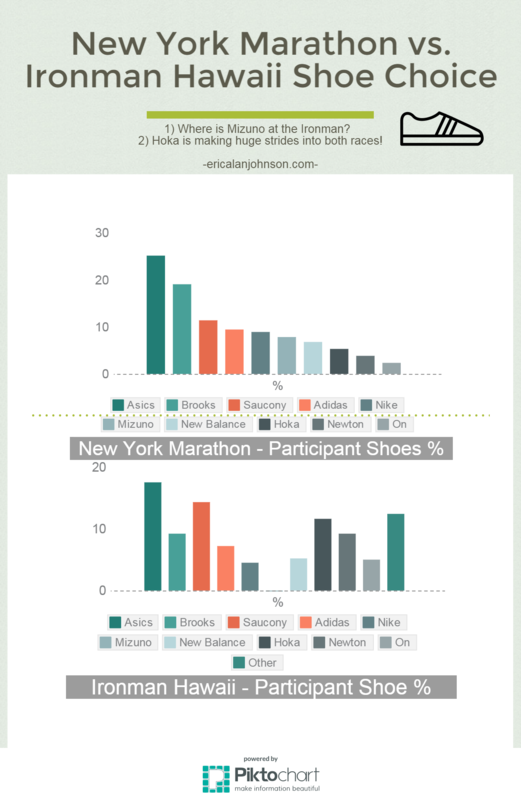 That’s why I was particularly interested to see this year’s shoe counts from the New York Marathon and Ironman Hawaii. The big trend is the continued growth of the Hoka One One brand. I try to be brand agnostic and in fact run in about 5 different brands of shoes, but I have to admit that my Hoka have saved me at both Ironman Arizona 2013 and Ironman Florida 2015 where my injuries prevented me from wear any other shoes. The other big change that pops out here is the near absence of Mizuno shoes on Ironman Hawaii athlete feet. I see it every day and hear the gossip from fellow running store owners and managers. Mizuno is struggling in running. It will be interesting to see if they can pull themselves out.